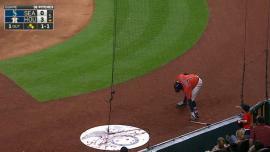 With Carlos Correa batting, George Springer steals (2) 2nd base. 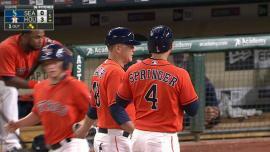 George Springer singles on a ground ball to right fielder Seth Smith. Jason Castro to 2nd. 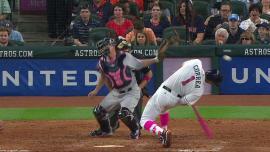 Carlos Correa singles on a line drive to right fielder Seth Smith. Jason Castro scores. George Springer to 3rd. Carlos Correa to 2nd. October 12, 2018 RHP Mayckol Guaipe assigned to Caribes de Anzoategui. May 5, 2018 Generales de Durango signed free agent RHP Mayckol Guaipe. January 30, 2018 RHP Mayckol Guaipe assigned to Venezuela. January 26, 2018 Tecolotes de los Dos Laredos released RHP Mayckol Guaipe. October 10, 2017 RHP Mayckol Guaipe assigned to Caribes de Anzoategui. June 26, 2017 Rojos del Aguila de Veracruz signed free agent RHP Mayckol Guaipe. March 11, 2017 RHP Mayckol Guaipe assigned to Chicago White Sox. November 7, 2016 RHP Mayckol Guaipe elected free agency. October 26, 2016 RHP Mayckol Guaipe assigned to Caribes de Anzoategui. September 2, 2016 Tacoma Rainiers activated RHP Mayckol Guaipe from the 7-day disabled list. August 22, 2016 Tacoma Rainiers sent RHP Mayckol Guaipe on a rehab assignment to AZL Mariners. August 22, 2016 RHP Mayckol Guaipe assigned to Tacoma Rainiers. August 6, 2016 Seattle Mariners signed free agent RHP Mayckol Guaipe to a minor league contract. 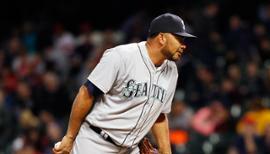 August 4, 2016 Seattle Mariners released RHP Mayckol Guaipe. June 9, 2016 Tacoma Rainiers placed RHP Mayckol Guaipe on the 7-day disabled list. May 17, 2016 Seattle Mariners optioned RHP Mayckol Guaipe to Tacoma Rainiers. April 25, 2016 Seattle Mariners recalled Mayckol Guaipe from Tacoma Rainiers. March 30, 2016 Seattle Mariners optioned RHP Mayckol Guaipe to Tacoma Rainiers. August 30, 2015 Seattle Mariners recalled Mayckol Guaipe from Tacoma Rainiers. August 15, 2015 Seattle Mariners optioned RHP Mayckol Guaipe to Tacoma Rainiers. August 4, 2015 Seattle Mariners recalled Mayckol Guaipe from Tacoma Rainiers. July 9, 2015 Seattle Mariners optioned RHP Mayckol Guaipe to Tacoma Rainiers. 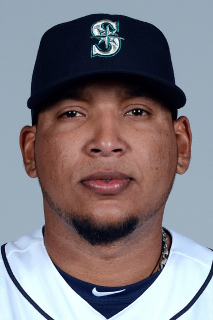 July 4, 2015 Seattle Mariners recalled Mayckol Guaipe from Tacoma Rainiers. June 2, 2015 Seattle Mariners optioned RHP Mayckol Guaipe to Tacoma Rainiers. June 1, 2015 Seattle Mariners recalled Mayckol Guaipe from Tacoma Rainiers. March 16, 2015 Seattle Mariners optioned RHP Mayckol Guaipe to Tacoma Rainiers. November 20, 2014 Seattle Mariners selected the contract of Mayckol Guaipe from Jackson Generals. October 9, 2014 RHP Mayckol Guaipe assigned to Caribes de Anzoategui. July 13, 2014 Jackson Generals activated RHP Mayckol Guaipe from the 7-day disabled list. June 28, 2014 Jackson Generals placed RHP Mayckol Guaipe on the 7-day disabled list. April 1, 2014 RHP Mayckol Guaipe assigned to Jackson Generals from High Desert Mavericks. March 3, 2014 RHP Mayckol Guaipe assigned to Seattle Mariners. October 9, 2013 RHP Mayckol Guaipe assigned to Caribes de Anzoategui. July 7, 2013 High Desert Mavericks activated RHP Mayckol Guaipe from the 7-day disabled list. June 25, 2013 High Desert Mavericks placed RHP Mayckol Guaipe on the 7-day disabled list. April 22, 2013 Mayckol Guaipe roster status changed by High Desert Mavericks. April 3, 2013 RHP Mayckol Guaipe assigned to High Desert Mavericks from Clinton LumberKings. October 10, 2012 RHP Mayckol Guaipe assigned to Caribes de Anzoategui. July 21, 2012 Mayckol Guaipe roster status changed by Clinton LumberKings. July 7, 2012 Clinton LumberKings placed RHP Mayckol Guaipe on the 7-day disabled list. June 25, 2012 RHP Mayckol Guaipe assigned to Clinton LumberKings from Everett AquaSox. June 13, 2012 Mayckol Guaipe assigned to Everett AquaSox from Pulaski Mariners. January 21, 2011 Mayckol Guaipe assigned to Pulaski Mariners from VSL Mariners. October 4, 2010 RHP Mayckol Guaipe assigned to Caribes de Anzoategui. October 9, 2009 RHP Mayckol Guaipe assigned to Caribes de Anzoategui.